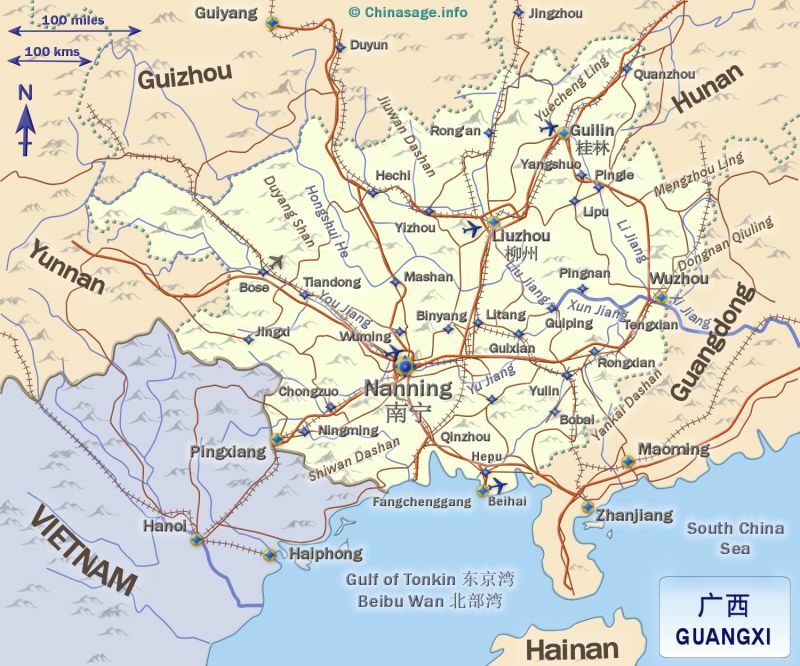 Guangxi is a mountainous province on China's south western border with Vietnam. It is home to a large number of minority peoples including: Zhuang; Yao; Miao; Dong and Shui people who live mainly in the western two thirds. They hold many colorful festivals throughout the year. 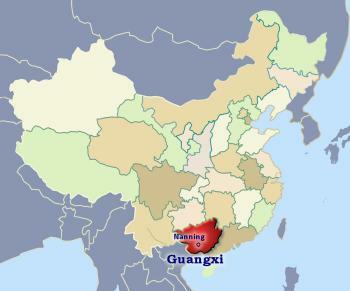 Reflecting its diverse ethnicity it is designated as Guangxi Zhuang Autonomous Region rather than an ordinary province. Li River near Guilin. September 2012. As a frontier province it shares much with neighboring Vietnam and Thailand; there is a strong Tai ➚ cultural influence. Geographically, it has high mountains in the west and north that define the river basin of the mighty Xi (West or Pearl) River. Back in the Zhou dynasty it was part of the ancient Baiyue kingdom ➚. In the early Han dynasty it came under the control of the breakaway kingdom of Nanyue ➚ together with neighboring Guangdong and Yunnan. For many centuries there was limited control from China's far away capital. It was during this period that there were sporadic rebellions that led to cruel reprisals by the Han Chinese against the indigenous people. Many of the Taiping rebel leaders came from eastern Guangxi. In the late nineteenth century it was claimed by France as the northern extension of its French Indo-China ➚ empire. It represents a poor relation compared to its neighbor Guangdong. During the Cultural Revolution infighting between rival clans that settled ancient grievances led to many deaths. The provincial capital Nanning has expanded very rapidly from a small market town in 1949 to a busy industrial city. Guangxi is best known for its scenic beauty. The river trip towards Vietnam down the River Zuo ➚ takes you past Neolithic rock art (people, animals and drums are paintings in ocher). Guilin and Yangshuo are popular resorts on the Li River ➚ as the river weaves through dramatic Karst ➚ scenery; multitudes of towering pinnacles of limestone cover a wide area. Many consider this area the most scenic in China. There is an old proverb 桂林山水甲天下 Guìlín shānshuǐ jiǎ tiānxià meaning Guilin's mountains and rivers are the best sights in the world. Guilin was the former provincial capital so is a large town. Guilin City has a limestone pillar: the Solitary Beauty Peak ➚ rising majestically from its center. Xiang bishan (Elephant trunk hill) has an old pagoda on its summit. Guilin is named after the Osmanthus or Cassia trees which carry sweet scent in the fall. Seven Star Park (Qixing) is renowned for its jagged limestone peaks. As well as lofty crags, the weathering of limestone has produced a number of caverns full of stalactites and stalagmites including the Red Flute Cave ➚. One cavern can hold up to a thousand people and is called the ‘Crystal Palace of the Dragon King’. 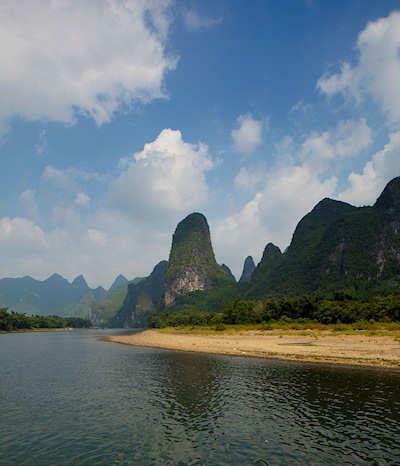 The river trip to Yangshuo on the Li River is an excellent way to see the magnificent scenery. Fishing with tame cormorants on the Li River is a well-known local custom, now financed by tourism rather than from the selling of fish. To the north of Guilin the Ling Canal ➚ was built to link the Yangzi and Pearl river systems by Qin Shuihuangdi over 2,000 years ago. Daxu downstream from Guilin has many shops and houses dating back to the Song dynasty. Wuzhou in the East of the province was an important town in the 18th century, and the British set up a river steamer service from there down to Guangzhou along the Pearl River. It is now well known for the trade in snakes destined for the dinner table. Huangyao is an old town with much intact Qing architecture; Guiping on the Pearl River is renowned for its West Mountain green tea while Detian Falls ➚, near the Vietnam border, rivals the Huangguoshu Waterfalls in neighboring Guizhou for splendor. The industrial city of Liuzhou is surrounded by the same style of Karst scenery as Guilin but on a smaller scale. Huaping ➚ has an extensive tropical nature reserve while Beihai is a busy port carrying out trade with Vietnam and a sea crossing to Hainan island. Guangxi has a sub-tropical climate, it lies on the Tropic of Cancer ➚ and so has hot, wet summers with short drier winters. In the limited flat areas provided by the river valleys rice (two or three crops a year); tea and tobacco are grown. Tropical fruit grown includes lychees, longans, pomelos, pineapples and bananas. It is also hot enough to grow spices such as aniseed and cinnamon. Agriculture remains the main industry, although in recent years a busy freight link with Vietnam has opened up the province for greater development. 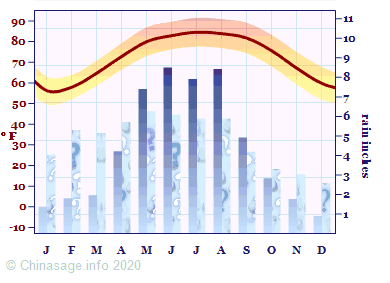 Citation information for this page : Chinasage, 'Guangxi Zhuang Autonomous Region China', last updated 28 Nov 2018, Web, http://www.chinasage.info/maps/guangxi.htm.